Our daughter, Lovay is wearing the costume. 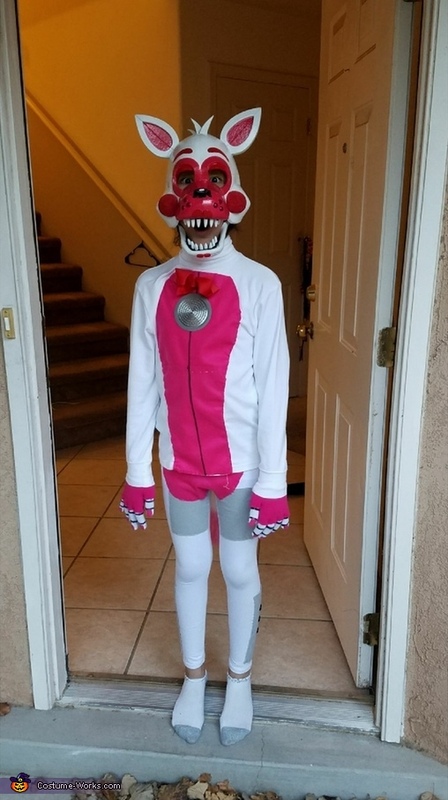 She wanted to be Funtime Foxy from Five Nights at Freddys, and they do not make that costume for purchase. Her dad and i made the costume and mask. Costume is made from a white turtleneck and leggings. We used felt and sewed it on, along with a boy tie, and a sink drainer to replicated the characters speaker on her chest. the mask is made of foam and is movable when she talks. I would like to make my daughters fun time foxy costume. What supplies and tools did you use? I'd like to know how to make the mask as well if u could either email me or post instructions please. Love it!! How did you make the mask? How can I get this for my granddaughter.